Mon….Feb. 28, 2011…….Last week was a good fishing week and we had some pretty good action despite the up and down weather. We had some heavy rains on Thursday night and we arrived to some very muddy and high conditions. 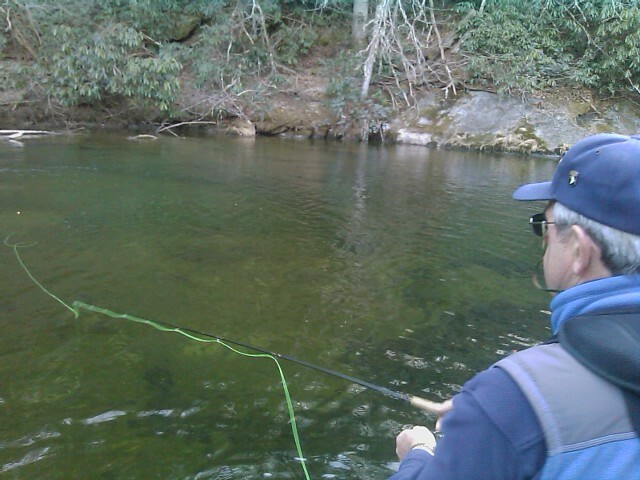 It was interesting though as Marty Hurley whom I guided put well over 30 fish in the net. Turns out the less than perfect conditions worked in our favor. The severe weather threat comes midday to afternoon and I would say that any fishing will be a challenging to do tomorrow. 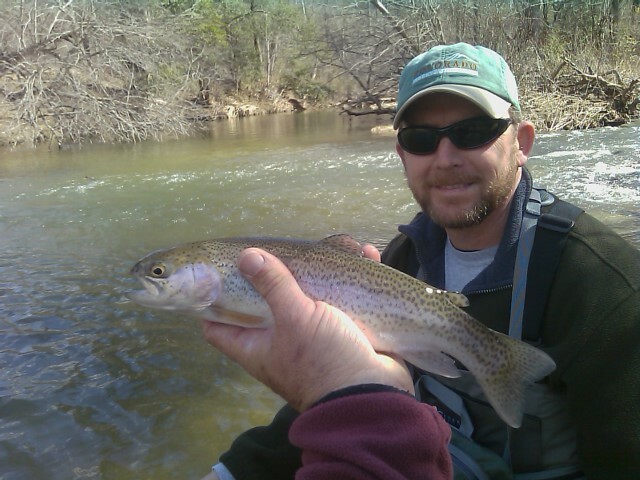 Have several trips and lessons this week, doing a fly fish 101 lesson with Todd Gerkin, then guiding Greg Adzima on 3-3-2011. 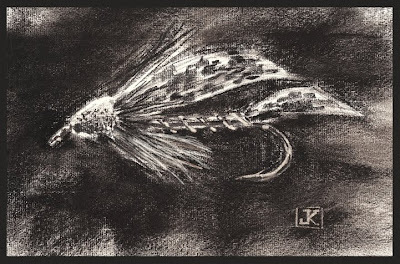 On 3-4-2011 I will be guiding Gregg Williamson and Jim Byrd, and Sat 3/5 Guiding Andrew Kearns on a 1/2 day trip—-then will be finishing up the day doing a fly tying and fly casting demo at a Sportsman’s Banquet at my mom and Dad’s church in Winston – Salem…. 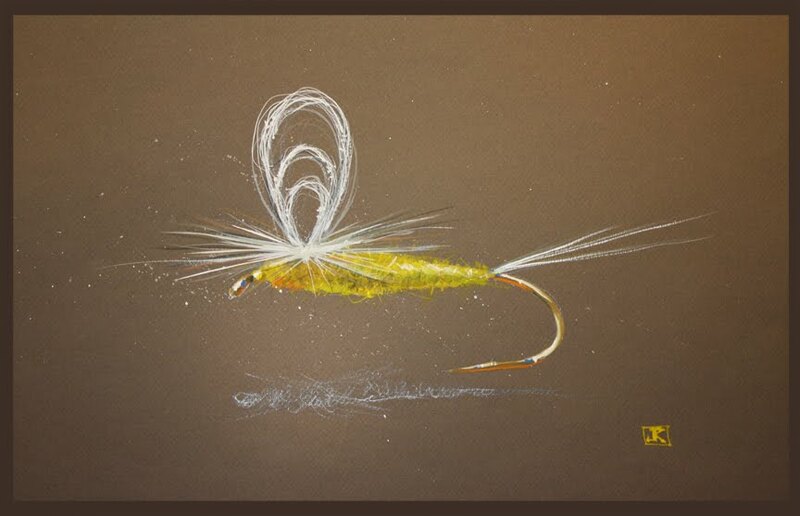 With all the unsettled weather and likely higher flows that are coming I would have some bright flies…..ice dubs, flashbacks, etc., you name it —and some streamers in the box. 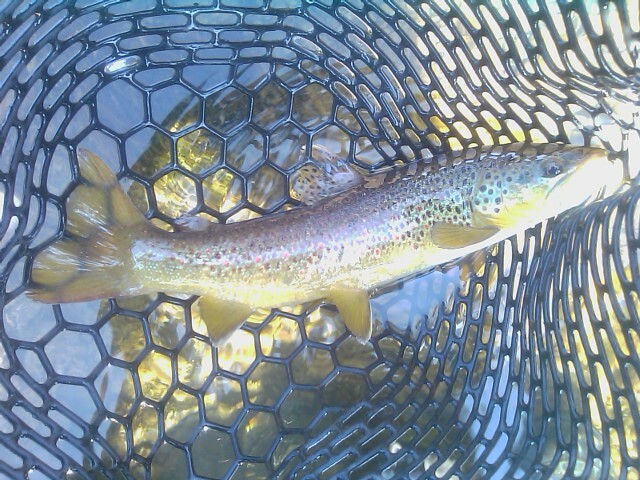 One of the best flies all of last week for me was my brightly colored bead head golden nugget. Hopefully the rain will pose no issues on the first spring stocking of fish on all Delayed Harvest waters. Right now everything is on schedule but a heavy spring rain can change all of that in a real hurry. I will be getting up to the minute info from some of the folks at NCWRC and Mallory Martin who is the fisheries stocking coordinator. Have a great week and hopefully some great fishing reports to come…! 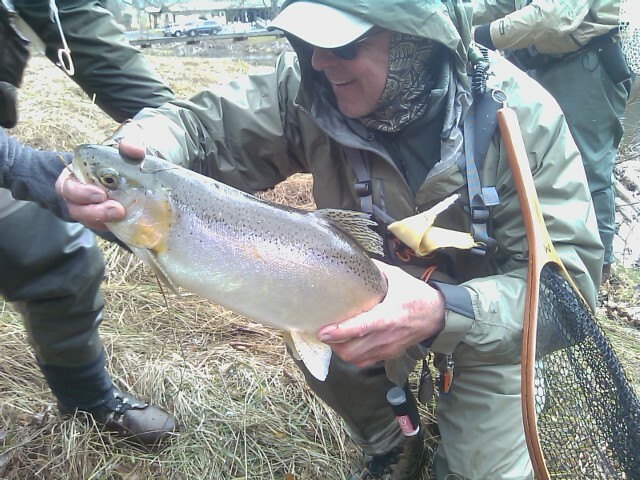 Heavy Rain, High Water, Still Fishing…. Fri……Feb. 25, 2011………Sorry for the delay in posting, have been very sick and fighting hard since late Thursday…! I guided Marty Hurley and I met Marty early and we headed out in quite a heavy rainstorm and high winds, most of the worst of the weather didn’t come through til the wee hours of the morning so there was no way to really know the impact of the rain without seeing it firsthand. I have been a little on the sick side too which made it a very enjoyable thing…lol….think I have been coming down with spring brown trout fever or something…..been catching too many rainbows lately…lol We made it to the first place I had thought of us fishing, knowing that there was a good chance the water would be high….but fishable? it would be a cointoss, and it could go either way. And if it were just high, we’d have a banner day. But it was high and muddy, about the color of a Caramel Frappe and moving towards Pumpkin Spice Latte….or in case you aren’t familiar with McDonald’s or Starbucks coffee drinks that would make it somewhere between a medium tan muddy and light orange muddy…unfishable to say the least. Virtually every water wider than the car was the same way, high, rolling, and muddy. So I decided we would try one last spot on the way home, and we’d ride there to see what it looked like and fish if it looked workable. It was, and even though it was marginal we did very well….which helped considering how much the yuk or sinus thing was bothering me. And Marty did an outstanding job of fishing a very heavy rig in high winds and heavy water…..it was a solid 7 or 8 on a 1-10 scale of difficulty. But I did what I have done for years, checked the places the fish like to hang out when the water is high, and fish a couple of flies they can see in the turbid water, and concentrate on getting the fly on the bottom. Worked like a charm, and we netted probably 30-40 fish on a day that originally we though might be a busted trip. Marty got into fly fishing several months ago via a trip /school gift certificate from his wife and in a short time has really gotten good at it. His hooksetting skills and reading strikes are very impressive, enough so on many occasions today that it would have made some good footage for a teaching video on how to read the drift, detect the strike, and respond with a hook set. Well done Mr. Hurley! We used a couple of flies, my golden nugget nymph did really well…my guess is that they can see it in off color water better than they could see a lot of other patterns. In any case, we made a great day out of what was a bust to begin with. Thanks Marty as always and looks like I will be spending the next day or so trying to beat this bug/sickness that has bitten me. Wed…..Feb. 23, 2011……Guided Larry Tomar and Dan Camia today, we had great weather but clouds left us and the stiff breeze laid down leaving us with some of the most challenging conditions you could ask for. Gin clear water, and a bluebird sky forced us to go really small. 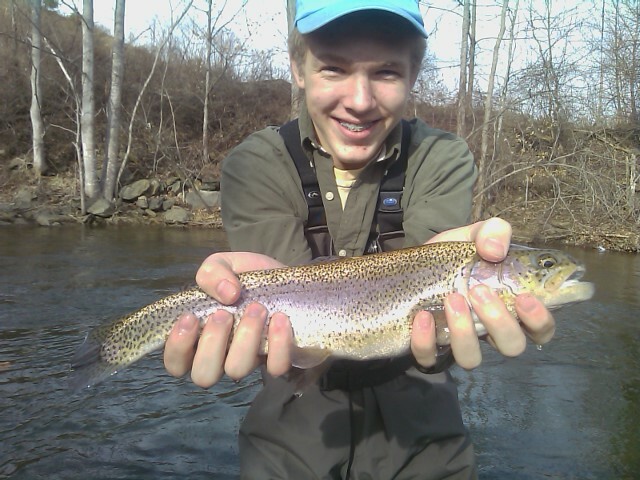 We landed 18-20 fish, all rainbows, but we used long leaders and tippets. And had to go to 7X and #22-24 flies to get consistent strikes. We caught fish on a variety of midge patterns ……Mercury Midges, Ice Dub Zebras, Olive Midge Pupae, and Black Beauties. Rising water temps and falling water levels are bringing out the bugs and bringing more and more fish up to feed on the surface. Looks like some wet weather is headed our way…we need some rain! Tues….Feb. 22, 2011…….The warm weather has really had an impact on water temps…though we are having a few cool nights it looks like mild weather and our first potential spring severe weather event looms for Thursday. Rising water temps and dropping water levels always create one opportunity….greater chances for rising fish and dry fly opportunities. 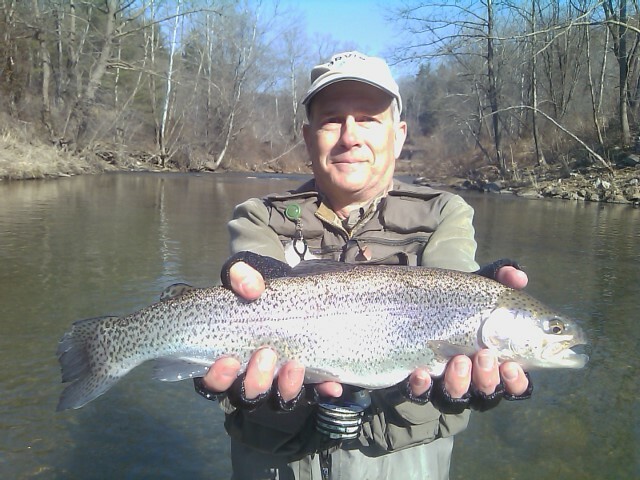 Had some great nymphing yesterday with Ron and Shap Davis and netted 40-50 fish, all rainbows, including several large fish and two citation rainbows over 20"….so needless to say the nymph fishing has been where its at lately. Guiding Larry and Dan Camia tomorrow and we will try our luck at some challenging fish…..looking forward to an enjoyable day. Have a great evening and more to come tomorrow…..
Mon….Feb. 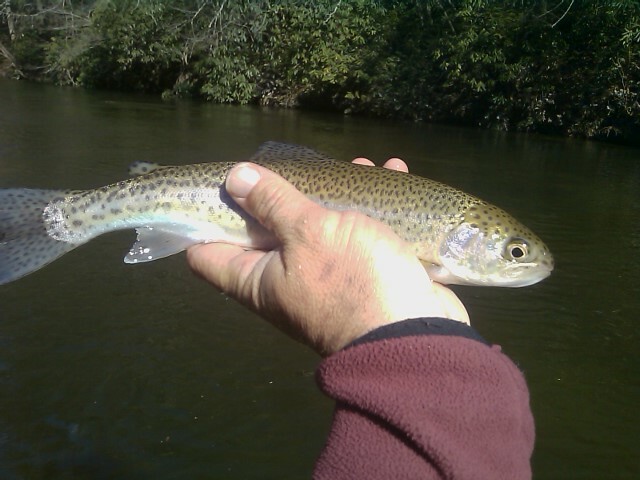 21, 2011……Great afternoon, still very windy, caught over 40 fish on the day, all rainbows, including 2 18-19" fish and two over 20"…..a bead head ice dub zebra midge has worked well, the large fish are eating it. 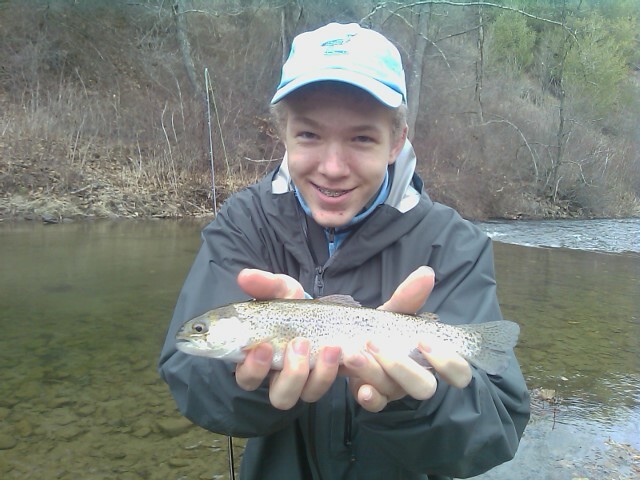 Water is high and 39F…but the fishing has been good. Hitting a few last spots…..
Mon……Feb. 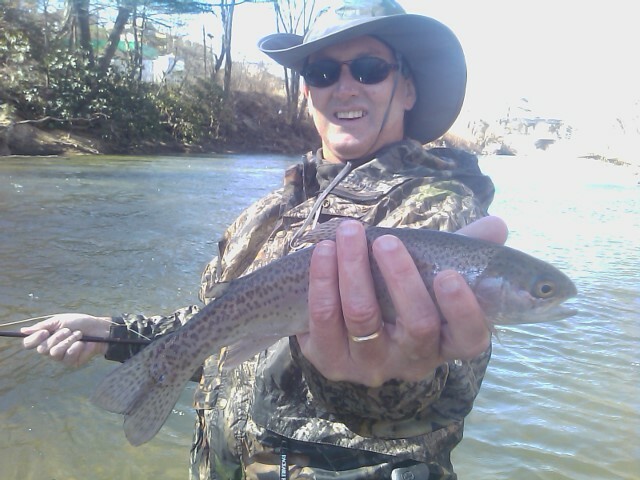 21, 2011…..Guiding Ron Davis and his son and having a good day nymphing. 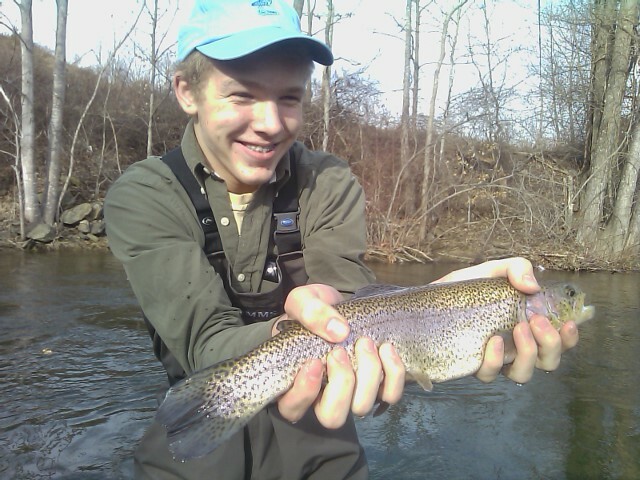 We have caught about 30 so far on small bead heads…a skinny nelson size 20 has been the fly. We are taking a break for lunch…..more to come..
Sun…..Feb. 20, 2011……Hope your weekend has been a great one, we did pretty well on the water on Saturday, guided Dr. Spencer Tilley of Greensboro, and we did pretty well landing 20-25 rainbows despite chiily conditions and high winds that blew 30-40mph most of the day…it was unreal. More warm weather coming, I will be on the water again on Monday guiding Ron Davis and his son. Looking forward to a good day, warm and cloudy is the outlook that may mean some blue winged olives……and if it doesnt we will do fine nymphing as that has been really good. Have a good week this week and we will have more fishing reports to come. Also, our smartphone app is available for download ..if you are interested reply to this email and I will send you the download link. Sat..Feb 19, 2011…….Good Morning..! Its early, headed up to the hills today guiding Dr. Spencer Tilley. We have another good weather day today, its supposed to be breezy but it won’t affect us very much as we will be fishing nymphs for the most part. I have an entourage of new nymphs to try…….more to come!